We’re pleased to announce our 2018 bursary winners. Congratulations to the Howard Legacy Youth Fund winners, Susan L. and Trent G. (pictured); and the AFABC Youth Bursary winners, Natasha L. and Zoe F.! We wish you all the best in your studies. Applications for our 2019 bursaries are now open! The intention of our bursaries are to provide funding that will assist in covering costs of tuition and/or costs directly related to the post secondary programs. 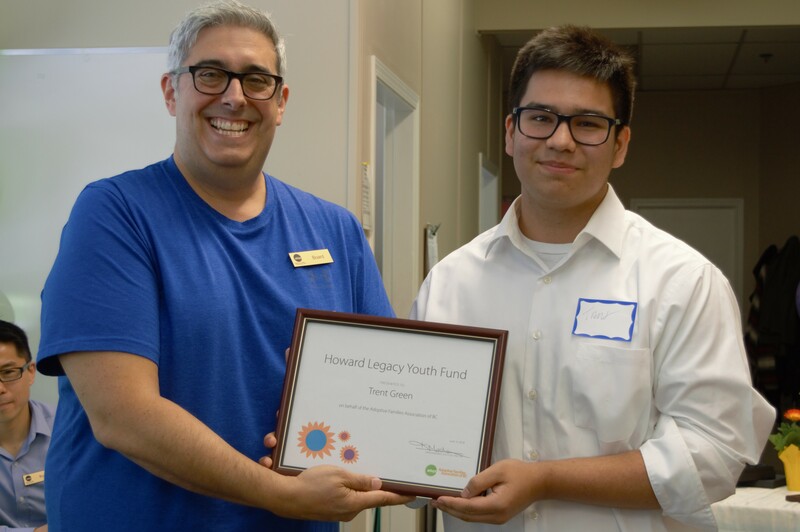 The Howard Legacy Youth Fund was established with a donation from Peggy Howard in 2012, and is made available to applicants who are current or former youth in care. AFABC Youth Bursary was established in 2014, with funding from the Adoptive Families Association of BC, and accepts applications from youth who have joined their family by legal adoption. 2019 applications are now open! Application deadline is April 30, 2019. All approved applications, (completed, meeting all eligibility requirements and submitted on time) will be forwarded for an initial screening process. The strongest applicants will be presented to the selection committee. Bursary applicants can apply for either (or both) AFABC bursary fund, but may only be chosen for one award per year. Previous AFABC bursary award recipients are permitted to re-apply in a new bursary year. All AFABC program clients are permitted to apply for either AFABC bursary. Current AFABC staff, board members, committee members, contractors and their respective children are not eligible to apply for either AFABC bursary. Former AFABC staff, board members, committee members, contractors and their respective children are eligible to apply for either AFABC bursary, 12 months after their organizational role has concluded. Please see individual application forms for details of eligibility requirements for the bursary of your choice below. If you have any questions or need assistance, please contact Caoimhe (Queeva) at scholarships@bcadoption.com or 604-320-7330 ext 183. Support the bursary program by donating to the Howard Legacy Youth Fund.